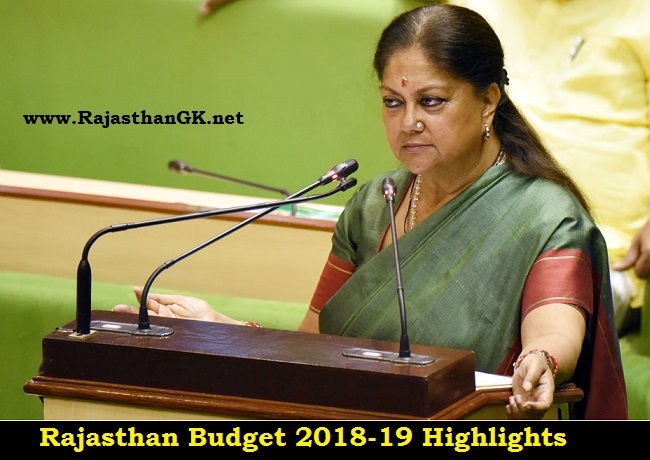 Rajasthan chief minister Vasundhara Raje on 12th February 2018 presented final budget for her term with announced one-time crop loan waiver of up to Rs 50,000 for small and marginal farmers and land revenue exemption. Free travel in state road buses for old age people beyond 80 years and 50 per cent concession for one attendant. Seven lakh new domestic electric connections in rural and urban areas of Rajastahn. Two lakh agricultural connections to dispose of pendency upto January 2012. The state government to provide Rs 544 crore for short term crop loan and interest subvention to the farmers by Co-operative banks. Substantial increase in honorarium and bearing entire amount of premium on insurance schemes of more than 1.84 lakh aganwadi workers under Women and child Development. Announcement to start 1000 new Annapurna Bhandar at fair price shops. Free Wi-Fi government colleges and free travel facility to interview aspirants for competitive exams conducted by UPSC, RPSC etc. Under Bhairon Singh Shekhawat Antyoday Swarojgar, loan upto Rs 50,000 to 50,000 thousand families at 4 per cent interest without collateral.